Today, over 200 vessels are deployed worldwide; an increase of over 100% in the past 15 years (Figure 1). 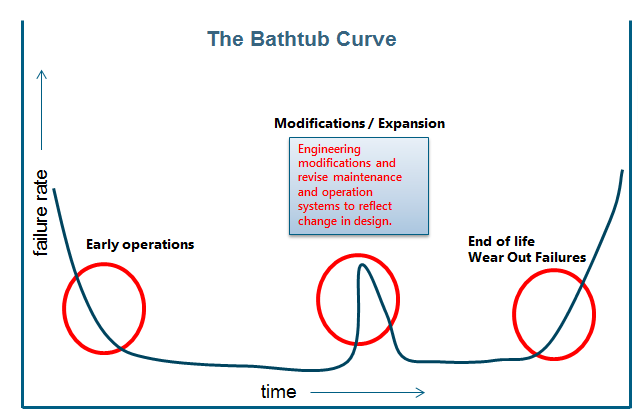 Many of these assets are therefore relatively young, but the ageing process (effectively described by the well-known bathtub curve, Figure 2) has inexorably started. 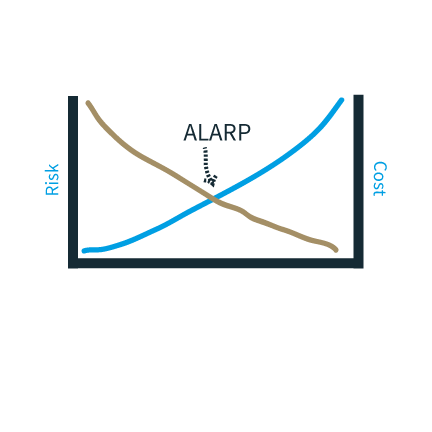 In the current demanding market conditions and considering the high cost of operations of these remote assets, it is imperative that an effective integrity management strategy is put into place which aims to increase the availability of the facilities, reduce maintenance costs while retaining an acceptable risk profile. What are the challenges in managing the integrity of FPSOs? Aggressive offshore environments, vessel motions and production demands can put floating and subsea facilities under significant stress, resulting in decline in availability and lower efficiency due to accelerated deterioration mechanisms. Inspection and maintenance programs play a key role in managing the integrity of the asset; however ineffective inspection and maintenance regimes not only negatively impact the safety of the asset but can introduce onerous and unnecessary costs. What do operators need to overcome these challenges and make integrity management work for them? In the past, many assets in the world switched from a traditional time-based to a risk-based approach in order to manage inspection and maintenance activities. Risk based methodologies can be used to provide justification for fitness for purpose and life extension and can be systematically applied to the whole FPSO installation or to individual components as an alternative to maritime classification. Incorporating the understanding of the original design intent and safety factors into this assessment in critical. However, even though performing an RBI exercise and identifying the most critical equipment of an asset can be a standard task, in the same way implementing the findings and managing the day to day activities using this approach can be a real challenge. For an RBI program to be effective and to produce real benefits it must be continuously managed and updated by competent personnel and embedded into the company culture. Integrity management decisions must be supported by technical justification which often requires advanced analysis to be performed in a timely fashion. Nowadays advances in inspection tools and numerical solutions enable us to reduce uncertainties and therefore lower inherent safety factors. 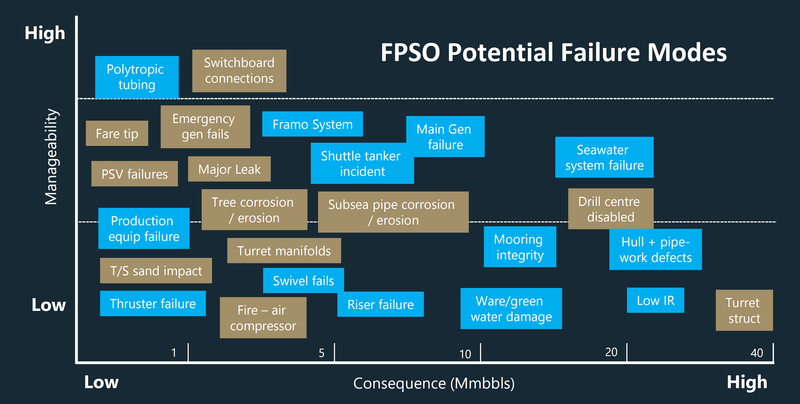 When an anomaly is detected, it is essential to find a practical and cost effective solution that can reinstate an adequate safety level; therefore it is crucial that FPSO operators can trust results from expert technical consultants. 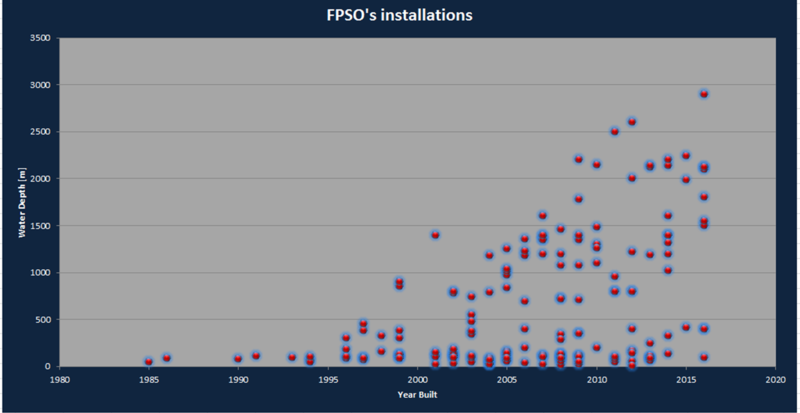 The evaluation of the fitness for service of FPSO components including; turrets, swivels, flexible risers, moorings, fairleads, the hull structure and corrosion protection systems require extensive knowledge of FPSOs and subsea specific potential failure modes (some of the potential FPSO failure modes are detailed in Figure 4). Ultimately having the right people, performing the right analysis at the right time can deliver significant value.